Boom! This is my 160th post! Thanks everyone for your support, and expect me to keep on supplying quality restaurant reviews far into the future. So, let’s start with a welcome to Mastication Monologues for first time viewers and long-time fans. Today’s post is part two of my Florida trip. 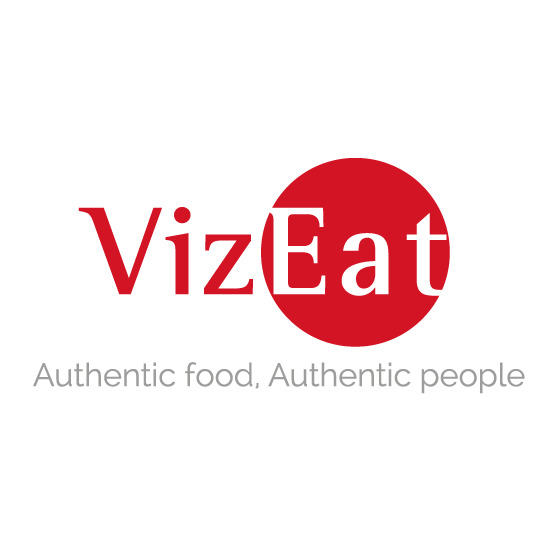 My previous post features an off-beat pizzeria that can satisfy even the most square food lover (as if there existed such a thing). 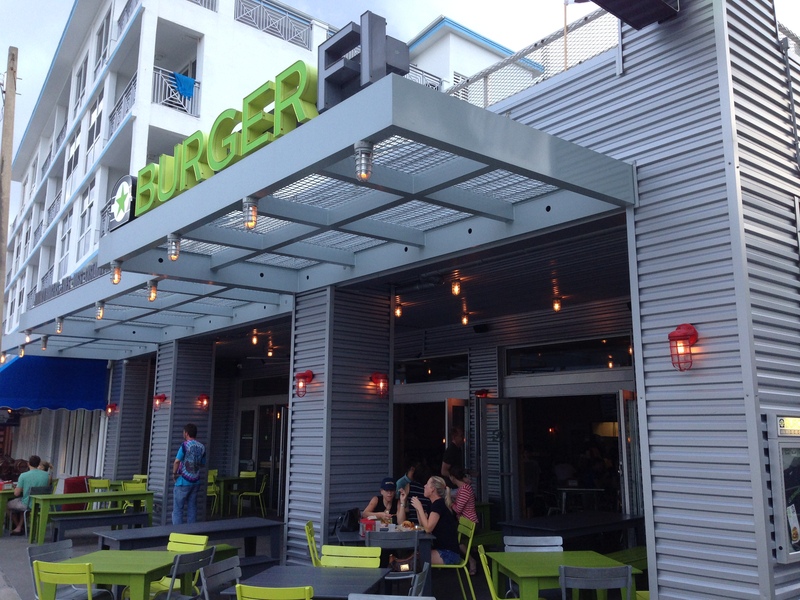 As for today, I’ll still be pushing the boundaries of my culinary fortitude as I recount my visit to BurgerFi, a place that reinvents both burgers and desserts. During our stay in Delray Beach, Florida, we did a bit of walking up and down the street lining the beach, and obviously there were plenty of restaurants to take advantage of the hungry swimmers and tanners. 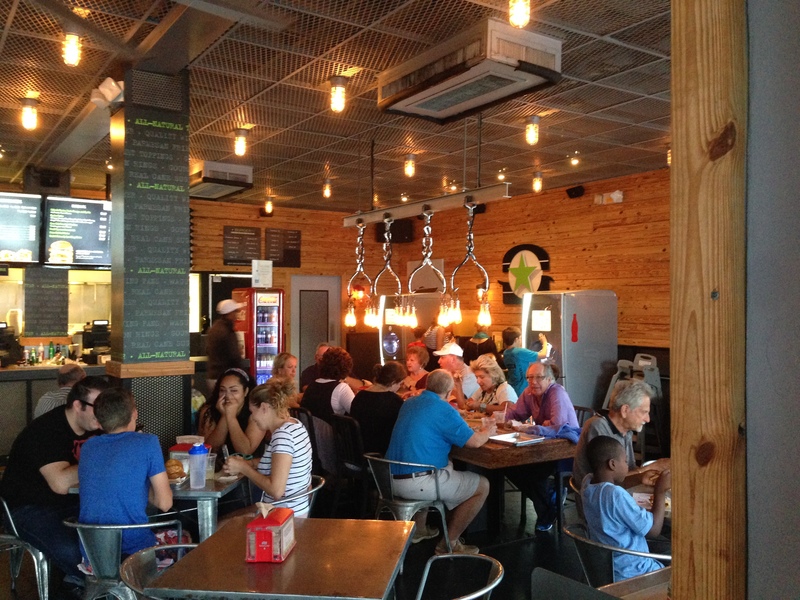 One place that caught my attention was BurgerFi due to its modern exterior and warmly lit interior. 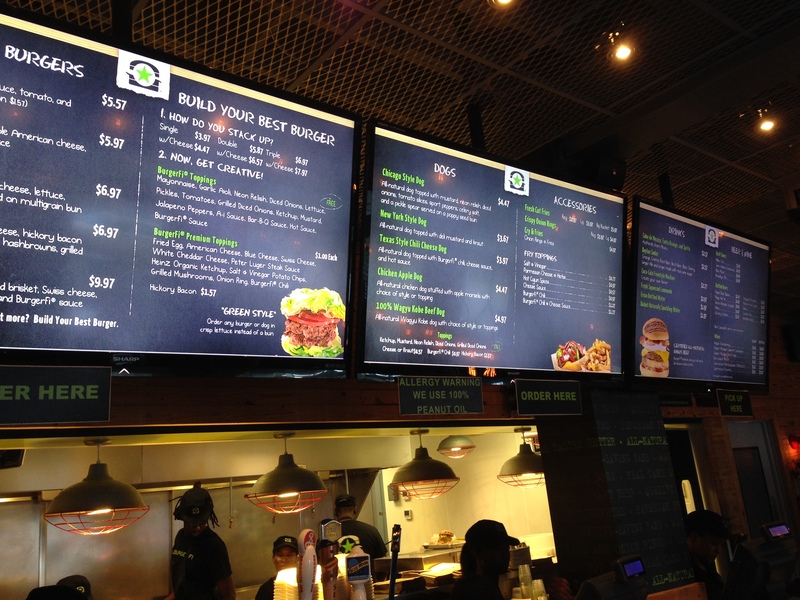 We waltzed past their outdoor patio to find an extensive menu that focused mainly on burgers but also offered hot dogs, sides, desserts, beer, wine, and a “secret” menu that boasted some interesting choices like a quinoa burger for all those vegetarians out there. I, however, went for the Breakfast All Day burger ($5.25) with a Coke de Mexico to drink ($3). They employed a buzzer system for orders where I just took my drink back to my table to wait for my burger to emerge from the back like a tasty bear emerging from its den after a long winter. 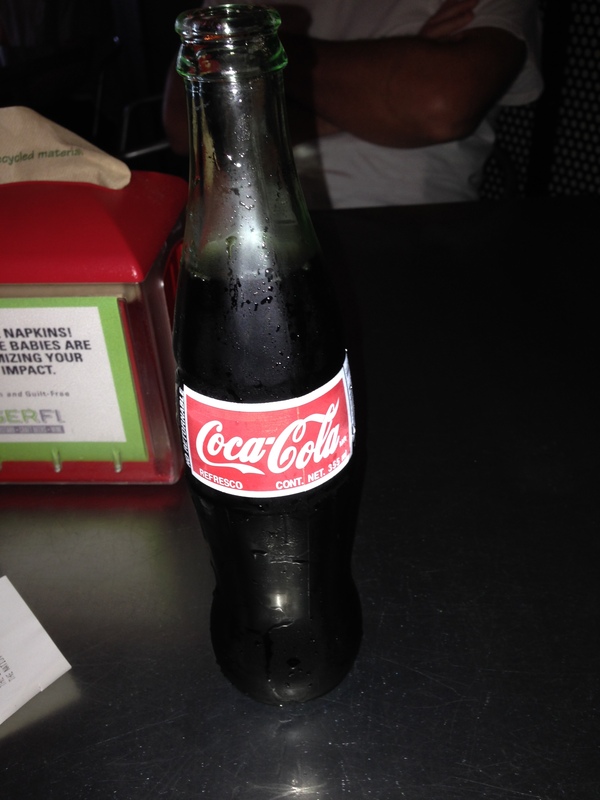 While it was being crafted, I sat at the table enjoying my Mexican Coke that I had never tried before. What separates the Mexican Coke from good old ‘Murikan Coke is that the former still utilizes regular sugar as a sweetener. In comparison, the American entry we now imbibe is laden with unhealthy high fructose corn syrup due to our country’s ability to grow a surplus of corn and the overall bottom line for the company in regard to production costs. What does this mean for me? Well, a definite taste contrast for one thing. While the American Coke could be described as a sweet but slightly acidic tasting cola, the Mexican Coke tasted a bit cleaner with a richer flavor. 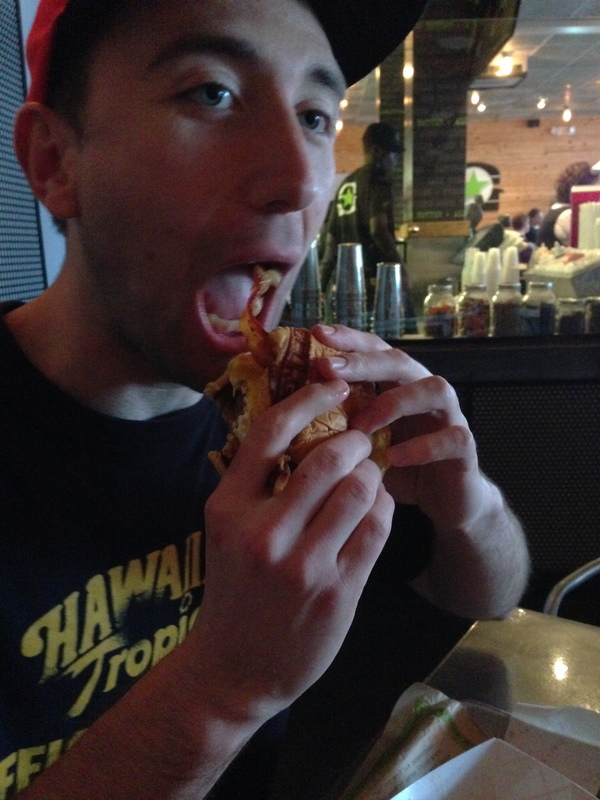 Eventually, my burger was ready, and it was slightly frightening. 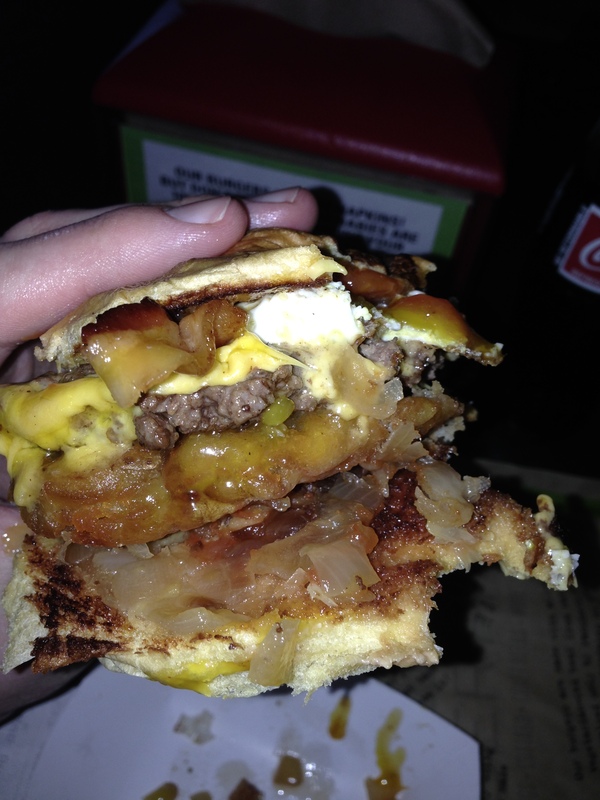 According to the menu, they start with an Angus burger and then pile on American cheese, hickory bacon drizzled with maple syrup, a fried egg, hash browns, onions, and ketchup. With the bacon strips sticking out like crimson tongues from the mini-monster sitting in front of me, I saddled up my taste buds and rode into the maw of the beast. The crunchy pieces of bacon crumbled beneath my full frontal assault, but I nearly lost my senses as the sweet mixed with the smokey and salty pork sent my head spinning…either that or I had a mini-stroke. 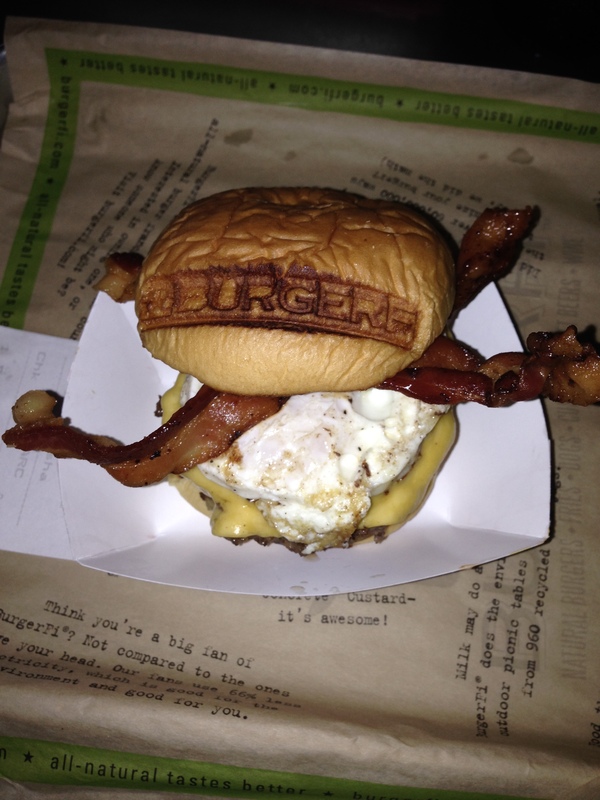 Once I passed that trial, I moved into the actual burger and was greeted with a liberal douse of egg yolk and meat juice. This was a testament to the quality of the meat that was grilled to perfection, and the egg that added an extra texture dimension to the meal. As for the hash browns, they were lying in wait at the bottom mixed up with the onions and ketchup to provide body to the burger. The only downside was the bun that quickly faded away with each bite, and the aforementioned hashbrown mixture contributed to the burger succumbing to Hot Mess Syndrome or H.M.S. If H.M.S. reaches critical mass, i.e. 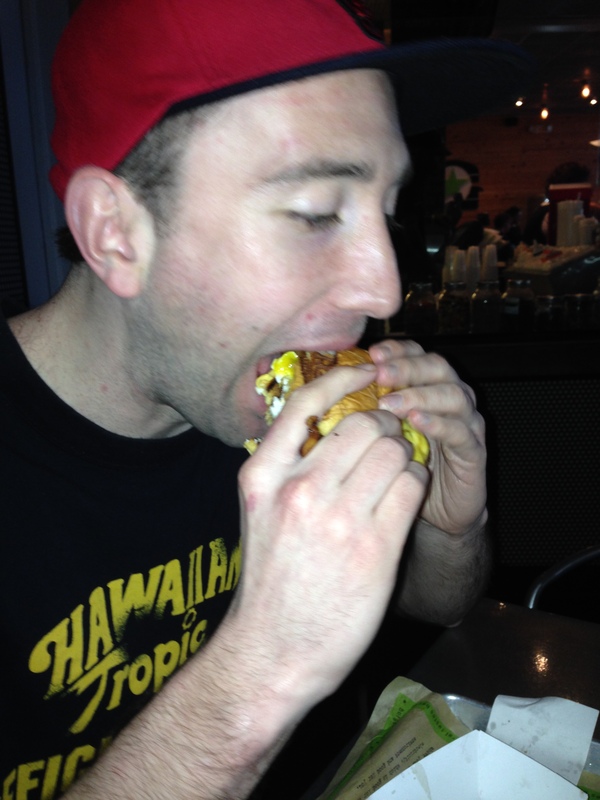 it’s a matter seconds before your burger falls apart in your hand, then you either have to make the decision to stuff it into your mouth or let it tumble to the table. Before long, I had reached this point, and I opted for the former option instead of letting it fall into the basket. This lack of burger integrity left me disappointed and covered in the remnants of my meal like a lion who just polished off a zebra. Once I wiped the scraps away from my hands and mouth, I decided to go for dessert because I was in vacation mode. I went over the ice cream options, and I plumped for the O.M.C. 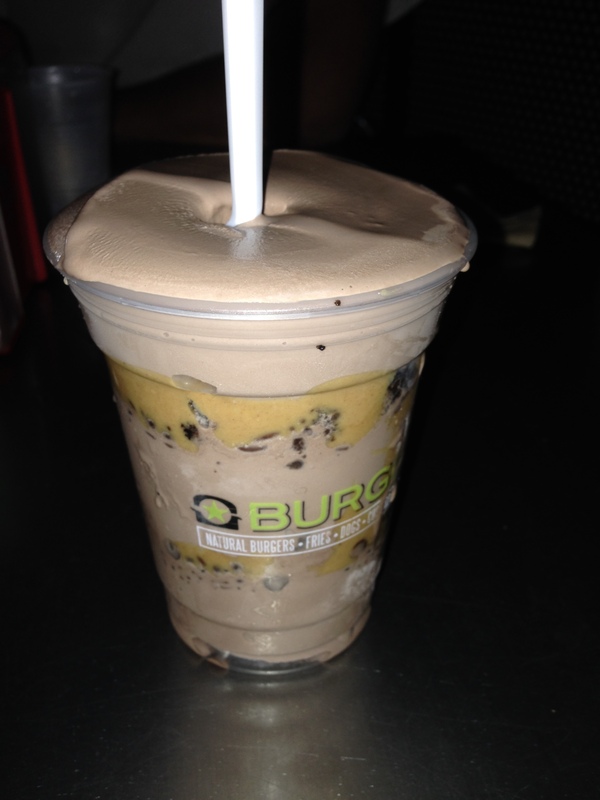 or Oh My Chocolate concrete ($4). This treat was absolutely ridiculous in construction and would probably be a tasty way to illustrate the layers of the earth. They alternated between layers of chocolate custard and then accompanying layers of peanut butter, chocolate chips, sprinkles, and brownie chunks. It was as decadent as it sounds, but I didn’t feel sick by the end of it. It was like eating a giant, liquified Reese’s peanut butter cup with occasional crunchy chocolate chips or chewy brownie bites. Needless to say, I was greatly satisfied by the meal as a whole as I cleaned up the slobber on the table when I finished. 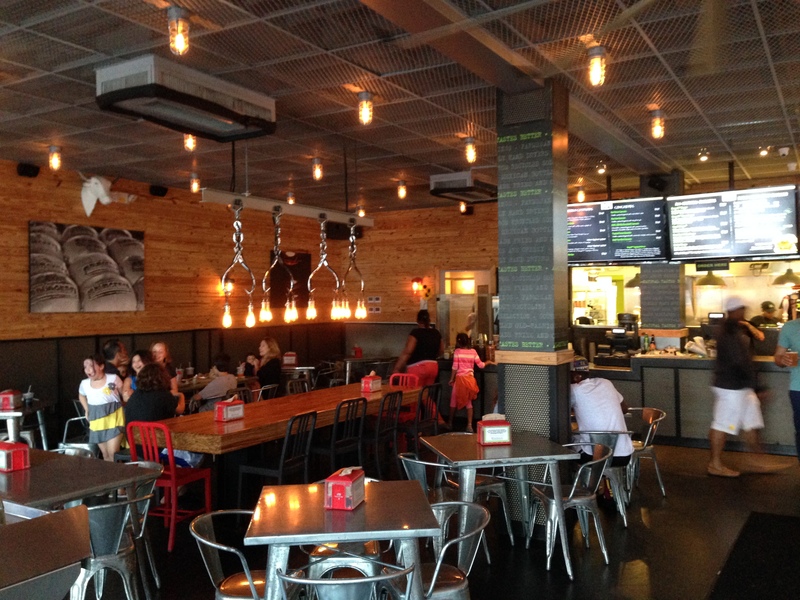 So if you want to try a burger place that provides high quality and creative meals at a reasonable price, then BurgerFi is the eatery for you! Posted in American Cuisine, Beverages, Burgers, Desserts, Ice Cream, Non-Alcoholic, Soft Drink and tagged bacon, Bar, beef, brownies, Burger, chocolate, chocolate chips, coke, egg, Florida, hash browns, ice cream, Mexico, peanut butter. Bookmark the permalink. Thanks! I’m glad you’re still following my blog, and I think that a Polish review is in order. The live squid was memorable, but I’m sure I will survive if they don’t have it on the menu haha.